When Flying Elephant, a multi-storey restaurant opened in Chennai, there was a lot of hoo-ha about it. But what is magnificent is that the hotel has lived up to it's billing and we only find excuses to go back to this restaurant - for the decor, service, food, and the liquour. The latest about this place is the jaw-dropping bar (it is also touted to be the biggest bar in the city) with some magnificent domestic and international liquor. In fact, when they hand over their bar menu to you, the chances that you might assume it is the food menu. (It is that extensive and massive). When the bar gets a makeover, it is imperative to give the food a new look, too? Going by that theory, Italian chef and the executive sous chef, Michele Cero, has revamped the bar menu and has introduced some interesting dishes like Three Cheese Jalapeno & Pesto Mushroom Tikka, Vegetables, Marinated Olives, Pesto & Garlic Baguette. We tried their Rakakat Basil, Mint, Cilli & Three Cheese Roll that was crispy, with the cheese perfectly blended with the masala. matter of time till all those rolls disappear. We highly recommend their Steam Edamame & Truffle Dimsum that is tossed with butter and is a tad spicy. Don't forget to dunk the dimsum in the chilli dip that only enhances the flavour. You can literally feel these white magic rolls melting in your mouth. 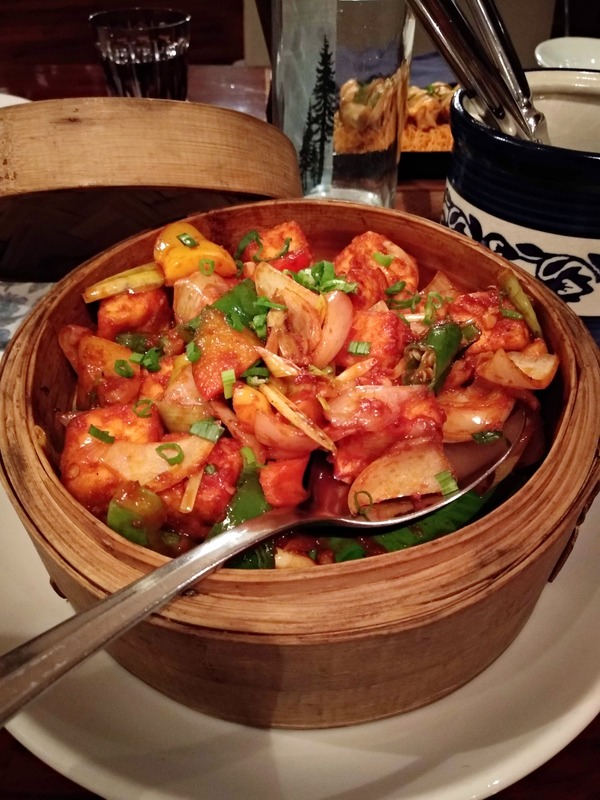 My personal favourite is their Wok Fried Chilli Paneer that is done to T. Acing the Indian-Chinese flavours, this dish is bound to be a hit among Chinese lovers. There is also a chicken variant to this dish. The mushroom tikka, on the other hand, is juicy, aromatic, and can do wonders if you are sipping on some whiskey. For the non-vegetarians, there are choices like Beer Batter Fish And Chips, Charcoal Lamb, Hand Pounded Garlic and Red Chilli, Chicken Satay With Peanut Sauce, etc. We felt experimentative and tried the Shish Taouk, Char Grilled Chicken, Onion Sumac Salad With Turkish Bread. The dish looks ornamental as it comes in a stand. The chicken with all its flavours and spice is the showstopper for the evening. Pair it with bread and salad, this one is hard to resist. The meal felt incomplete without dessert and so we went with cheesecake (that burst our heart with happiness) and chocolate mousse. The cheesecake came with sorbet and freshly cut strawberries. We bet you will forget all about the world when the first spoon of cheesecake enters your mouth. See your counterparts facial expression change as you take in that chocolate fantasy bit by bit. If this ain't life, what is? Feel rich when you go to this place as the prices can hit the pocket!